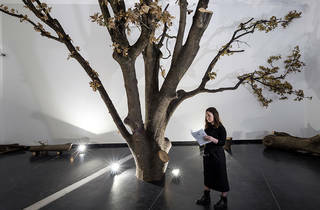 At the centre of this exhibition is an oak tree, installed floor-to-ceiling within one of the galleries of the Australian Centre for Contemporary Art, as part of an artwork by Swedish collaborators Simon Goldin and Jakob Senneby (aka Goldin+Senneby). It should look as though the tree has grown from the floor. 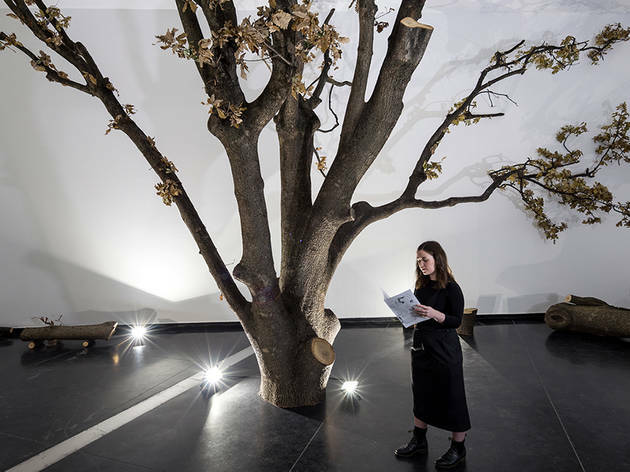 As magical as that sounds, so does the artwork: every day at 2.12pm, a gallery attendant will read out a short story about a drycleaner called Anders Reuterswärd who dreams of working in an art gallery – and conceives of a work where an oak tree grows from the floor. Throughout the exhibition, ACCA’s attendants will wear mismatched ‘uniforms’ made out of clothes left at local drycleaners, repurposed by Melbourne-based designer Annie Wu. The work takes the title of the short story it is based on: The Length of a Miracle. Curator Annika Kristensen describes Goldin+Senneby’s work as a layering of collaborations – with Swedish writer Jonas Hassen Khemiri, with Wu, the dry-cleaners, and of course each other. She sees it as the conceptual centre of Greater Together: an exhibition of eight works by artists who defy individualism in some way – often by working together and sharing skills. Elsewhere local collective Field Theory will reconceive ACCA as the ‘ultimate bunker’ within which to survive an apocalypse, and engage community skills-sharing and survivalist groups to run six workshops during the exhibition, covering topics such as 'Safety, Security and Self Defence' and radio communications. Field Theory’s work is one of three new commissions in the show; the others are a performance by Berlin-based Brisbane artists Sarah Clark and Nicole Beaumont (who work together as Clark Beaumont), and an installation by Dutch artists Liesbeth Bik and Jos van der Pol (aka Bik Van Der Pol). Both are about climate change. The other artists presenting works are Céline Condorelli, Antoinette J Citizen and Courtney Coombs, CT Jasper and Joanna Malinowska, and Patrick Staff. In Kristensen’s mind, it’s not that skill-sharing, collaboration or collectivity is a new thing for artists – she points to the studios of Renaissance painters, conceptual art, Andy Warhol, Damien Hirst, and the relational art movement – but more that it’s currently trending in society generally, with the rise of the sharing and gig economy.